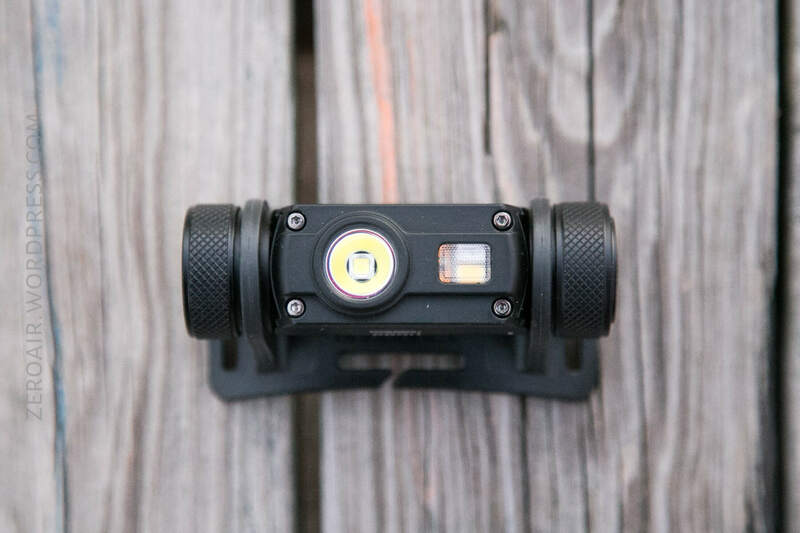 Nitecore has a few headlamps out now and this one is an interesting entry – it has three emitters. A main emitter, a secondary NW emitter, and a red emitter. All powered by a single 18650 and in a reasonably small package. Really just one version, but NitecoreStore sells a few accessory options with the HC65. The price of this one is $74.95. While this isn’t my favorite format (emitter in the center of the body on an 18650 headlamp) I have to admit I like this one a bit. The NW is good, and a red is a nice bonus. 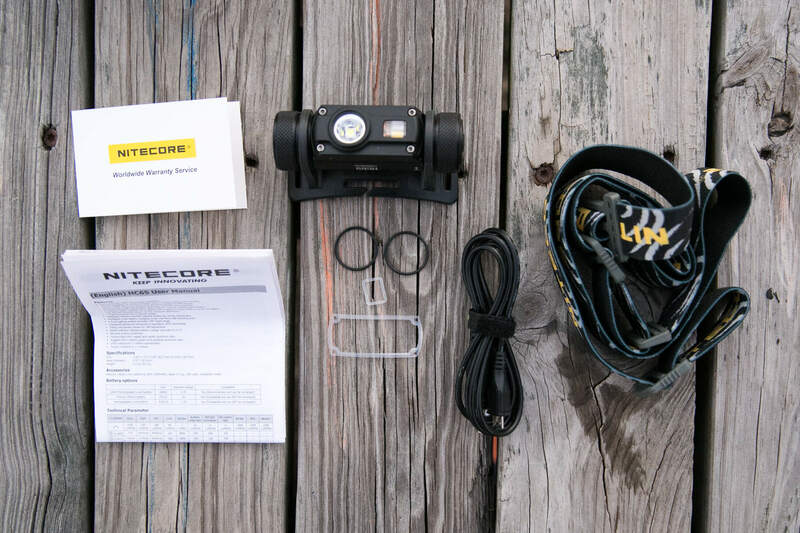 The package is the usual black and yellow Nitecore package. Usual specs and features on the box. A bit of a large box for such a small light, but there’s a lot of stuff in there. Here’s a pdf of the manual. Nitecore is consistent with their manuals, and this is no exception. It’s a nice manual with a good description of the UI, specs, features, modes, and runtimes. 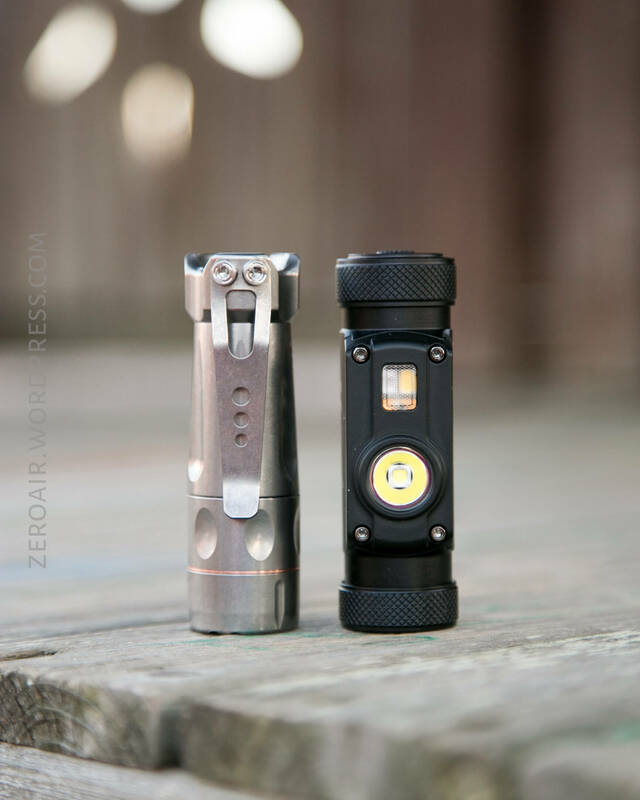 Nitecore has another high quality build on their roster now. I’m satisfied with the moving parts, and the emitter parts don’t give me any concerns either. The emitters (4) are housed in a plate of sorts, held on to the cell tube by four hex screws. Unfortunately my set is missing the one hex that’s the right size for this, so I wasn’t able to take it apart. However, it is just regular hex screws, so accessing the internals of this plate should be fairly straightforward. The tail end of the light is the end without the switch. The positive terminal of the cell goes toward the “head” of the light which is the end with the switch. Internally these are different, too. The head end has a brass button, and the tail end has a gold plated spring. The head/switch end’s cap does come off but unscrewing but the light isn’t “open” then, only the micro-USB port is exposed (and the switch may be maintained). One of the things I normally don’t care for about these style lights (emitters on the tube) is that they always feel bigger than they should be. This one really doesn’t. Of course this is a headlamp, and so the primary means of carrying this light will be the headstrap. This is a stretchy cloth band, which has an easily removable center (over-head) band. These bands just slip in to their connection place. It’s a comfortable headband, but I’m not sure it’s quite tight enough for running and the like. However for camping, or just general use, it’ll be great. The plastic piece that holds the light to the band is nicely contoured for the forehead. 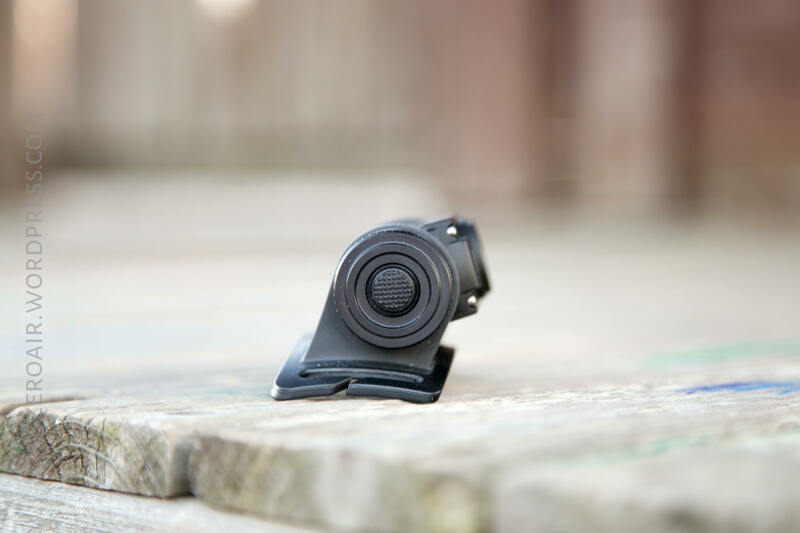 The light slips in and out of the plastic piece easily, with just two silicone loops on each end of the light. 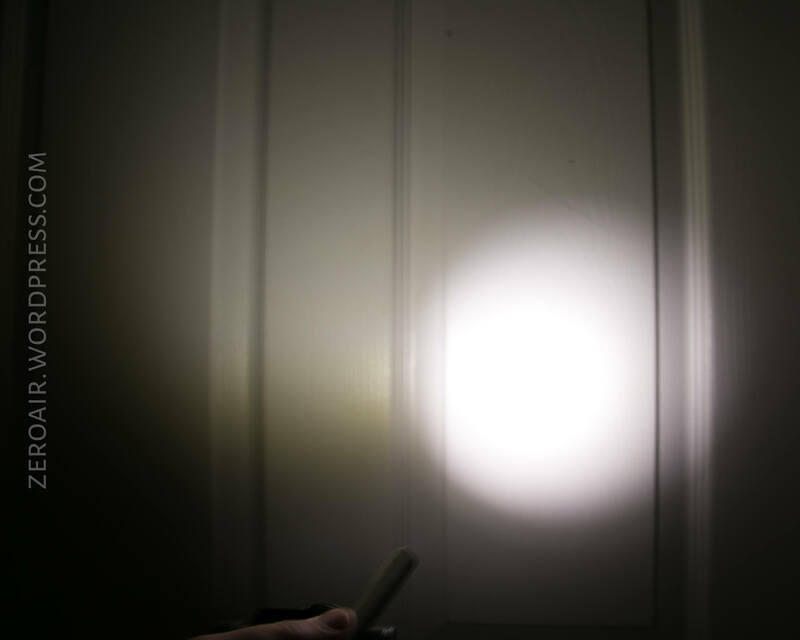 This is primarily how I use the light, even though it’s not ideal as a pocket light. There’s nothing else: No pocket clip, no magnet, no pouch. 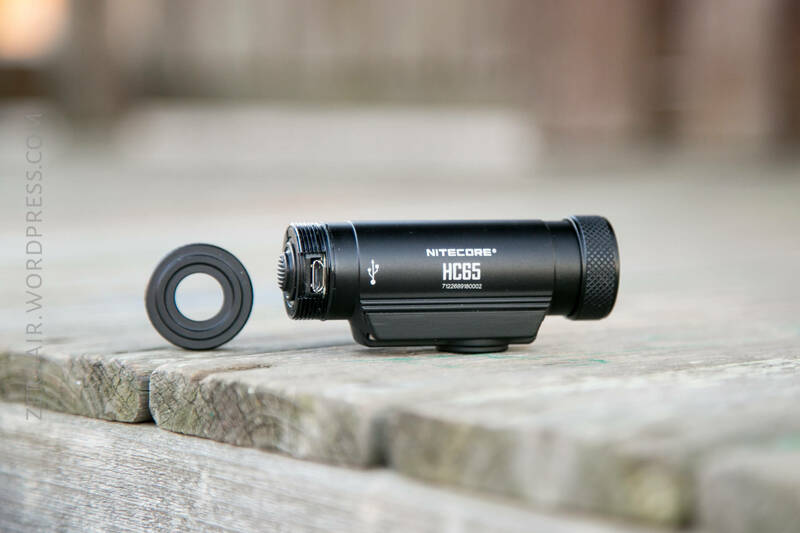 The HC65 is powered by a single 18650. 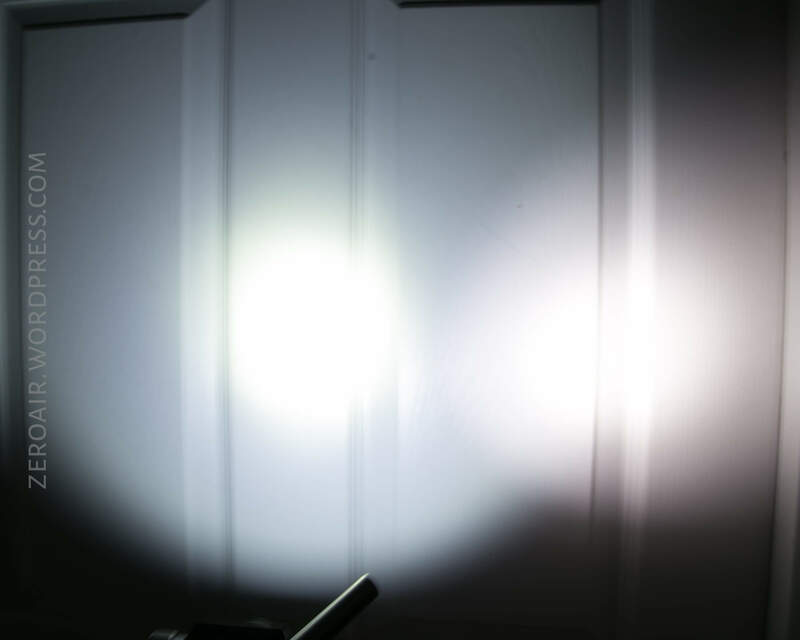 It’s also possible to use the light with 2-up cells: Cr123 and RCR123a. I tested the light with this option and the output wasn’t actually different (no greater output than with a single 18650). 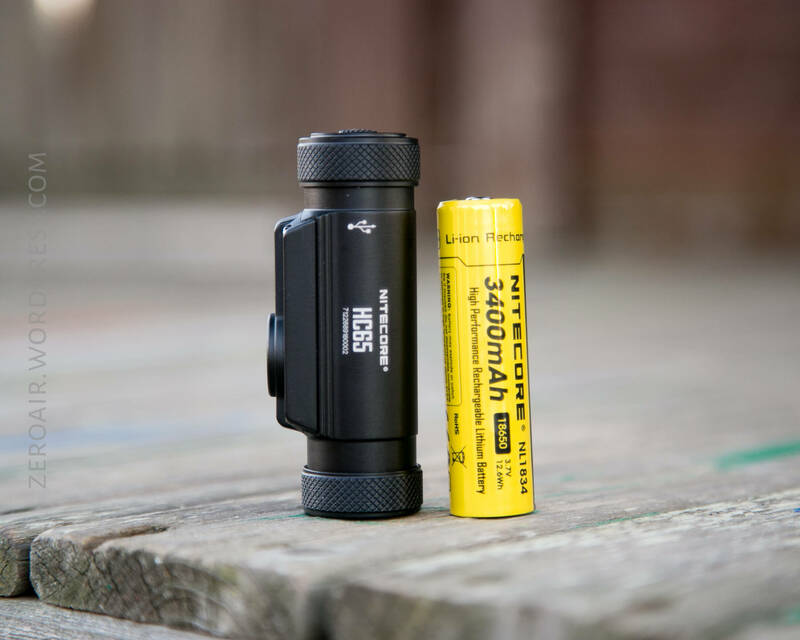 A cell is included – it’s the Nitecore NL1834, which is a 3400mAh 18650. It seems like a high quality cell. It’s a protected button top. The HC65 should work with any type 18650, though. Here’s a runtime on Turbo. 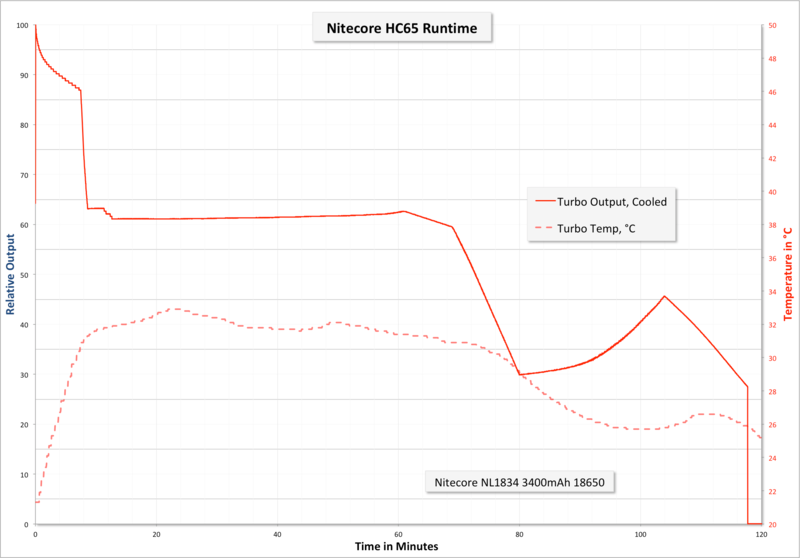 The runtime estimate on Turbo is 1h, and the HC65 does output light for that long. Turbo maintains >90% output for around 10 minutes, which is not too shabby. The light also has on-board charging, facilitated by a micro-USB port in the head. The headcap must be fully removed in order to use this port. When closed, there’s an o-ring that should seal the port nicely. Actually two, because there’s on on the switch, too. The charging isn’t the fastest charging, but it’s solid, at around 0.5A. And it’s a good li-ion charge curve, too. The cell tests to around 3200mAh. 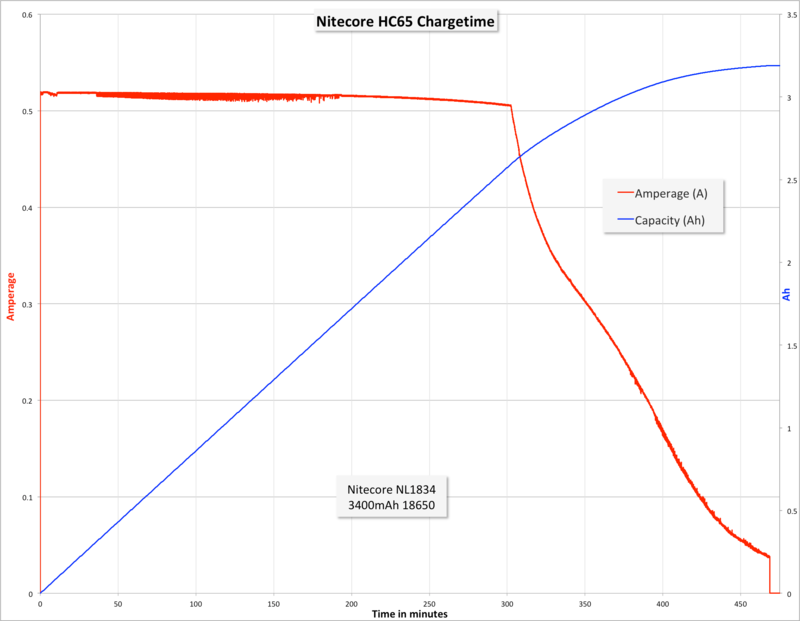 This chargetime is approximately in line with the specification Nitecore states (7h). There’s also a built in battery check option. When a cell is inserted and the parts are snugged down, the blue emitter will blink for the Ones and Tenths of voltage. So 4 blinks, pause 1 blink, is 4.1V. It will indicate the series voltage when 2-up cells are used, too. There’s just one switch on the HC65. I don’t think it’s all that different from many reverse clicky switches, but Nitecore describes it as a “camera shutter” style switch. It has a rubber cover, and some nice knurling. To be sure, this UI is basically one you’ll just have to memorize (or flubb your way through). This might be construed as a difficult UI, but that’s one price you pay for having so many emitters and options in a light. The main emitter here is a Cree XM-L2, and is coolish. The secondary emitter is a high CRI (≥90) NW emitter, and there’s a red emitter also. The 4th emitter I mentioned above is the blue, which is used as a beacon, and for cell voltage indication. The main emitter is at the base of a very short, very broad smooth reflector. The beam afforded by this setup is a quickly broadening beam, with a fair amount of spill. The other two emitters are behind a dimpled lens, and are fully flood. 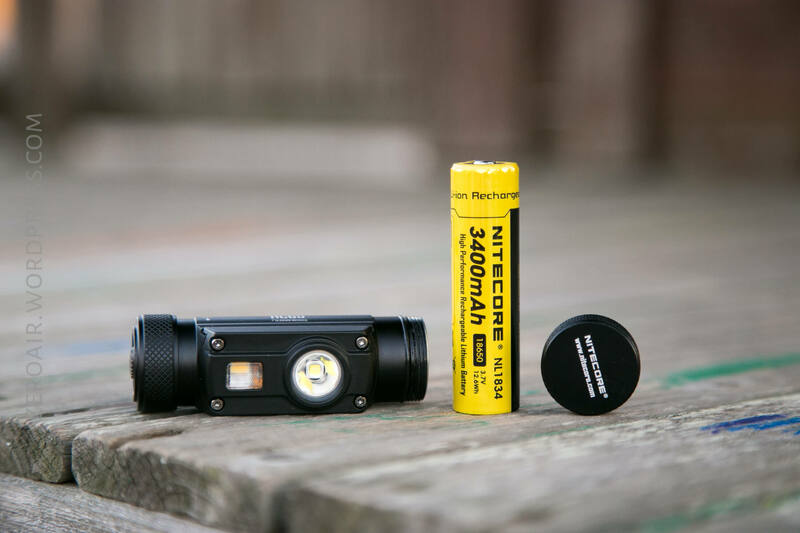 Nitecore makes some of their own competition for this light. But as this is the most current option, there’s not much point mentioning those. 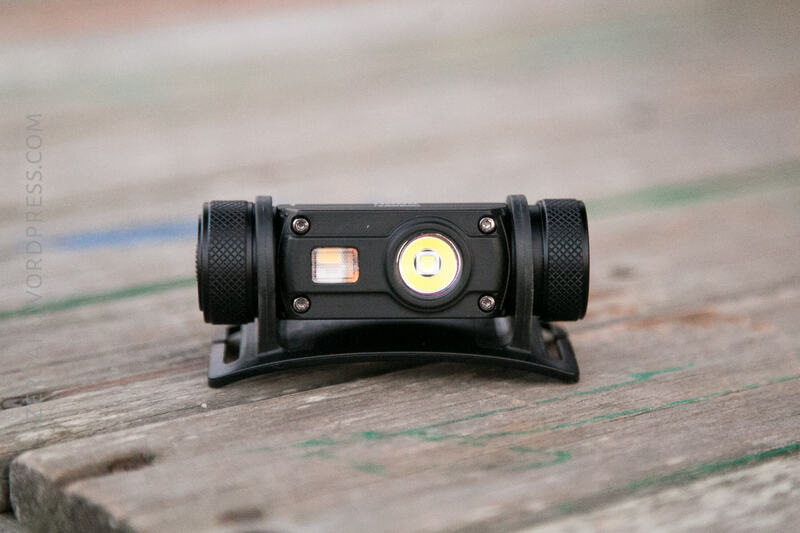 Thrunite makes a few lights like this, as does Fenix. The HC65 is quite compelling, as it has multiple emitters and reliable on-board charging. Main emitter could be warmer, even if not as warm as the high CRI emitter. UI is a little complex, but not necessarily complicated. 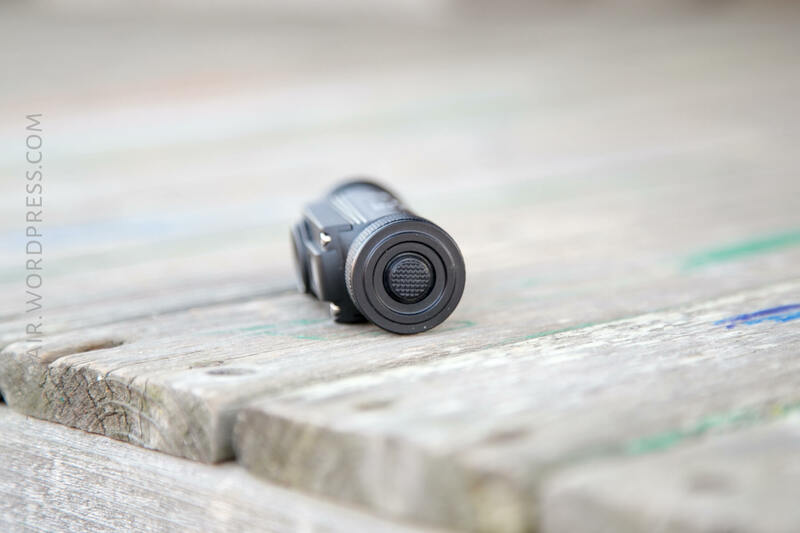 I hope to wrap the Acebeam X80 this week, and a couple of other blog-only things too. Maybe another Acebeam by the end of the week! This light was provided by NitecoreStore for review. I was not paid to write this review.